Dr. Michael Swor is a vConfidence approved physician who founded Swor Women's Care in 1998 with the desire to specialize in providing advanced gynecology, urogynecology, and gyn-surgical care, and he is particularly pleased to offer advanced vConfidence solutions designed to help empower women to enjoy their feminine life more holistically and fully. Dr. Swor received his medical degree from the University of South Florida College of Medicine in 1981 and did his ObGyn specialty training at the University of Florida in Jacksonville. Dr. Swor has trained with some of the most respected gynecologists in the country and has been an assistant clinical professor of OBGYN at the College of Medicine at USF in Tampa and also the College of Medicine at Florida State University for many years. In 2014, Dr. Swor became the first area gynecologist to receive sub-specialty board certification in Female Pelvic Medicine and Reconstructive Surgery (urogynecology). Dr. Swor served as the chairman of the department of ObGyn at Sarasota Memorial Healthcare Systems from 2006-2011 during a time when the department was ranked #1 in Florida in 2006 by US News and World Report. Under his leadership, the gynecology department, which Dr. Swor chairs, has been ranked #2 in Florida for three years and is the top-ranked department in any specialty in Southwest Florida. 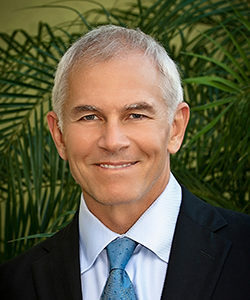 Dr. Swor is beloved by his patients for his kindness, professionalism and focus on providing his patients with the best care possible, and he has repeatedly been listed in the Castle-Connelly Top Doctors in America list as well as Suncoast Best™, Best Doctors™ and Best ObGyns in America. In 1998, he was honored with the prestigious Distinguished Alumni Award for Professional Achievement, by the University of South Florida. Since the early 1990’s, Dr. Swor has trained other physicians through the department of ObGyn at USF Tampa, and he is a fellow of the American College of Obstetricians and Gynecologists and the American College of Surgeons. Because of his early work in a new sub-specialty, Dr. Swor was also a founding member of the Accreditation Council of Advanced Laparoscopy and Hysteroscopy. He has many years of experience providing and training others in advanced Gyn, robotics, reconstructive and laser surgery. Dr. Swor’s interests are in new technology, advanced procedures, and surgical safety. In 2007, he became one of the first gyn surgeons in the country to use the Davinci Robotic surgery technology, and he now trains other surgeons in the appropriate use of robotics and other techniques, and he is particularly proud to offer advanced vConfidence solutions as the most cutting edge technology available for helping women achieve their intimate feminine goals for cosmetics and wellness through non-surgical techniques. Contact us today to set up your consultation with Dr. Swor, and learn how the vConfidence difference can help you to enjoy excellent feminine health for life.